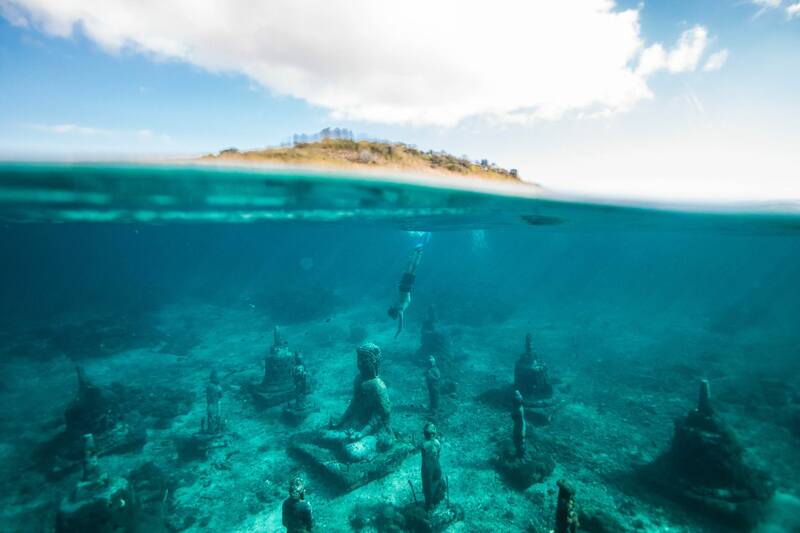 To show you just how diverse and beautiful the island of Bali is, we've handpicked a few of our favourite places that are somewhat off the beaten track. Hopefully, this will inspire you to get off the deck chair, leave your villa or hotel and venture a bit further next time. The Coral Garden dive site is located on the north coast of Menjangan Island Bali. It is a man-made coral garden that has attracted schools of beautiful fish, soft corals and sponges and if you're lucky, often a turtle or two. The site is suitable for both Scuba Diving and snorkelling. 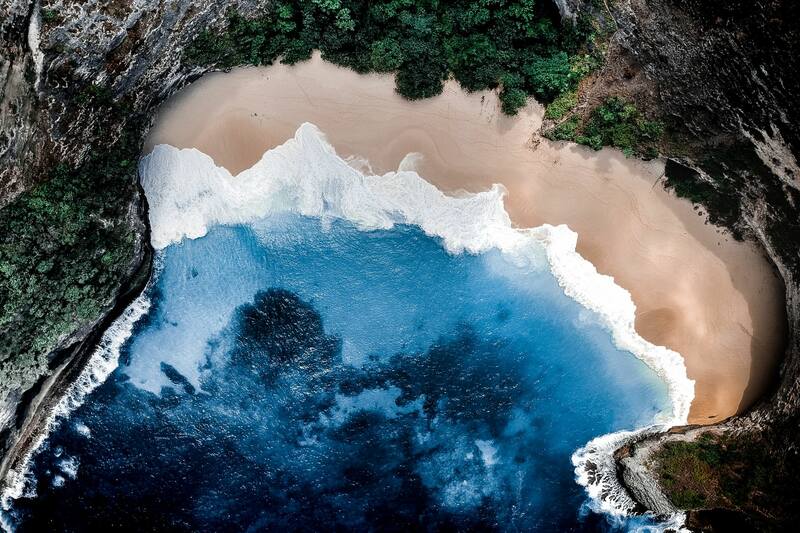 Kelingking Beach is a hidden beach in the village of Bunga Mekar, on the southwestern coast of Nusa Penida island. You can climb to the top of the hill behind the beach to enjoy what is probably one of the most breath-taking views in this corner of Bali or just relax in this secret little beach which you (hopefully) have all to your self. 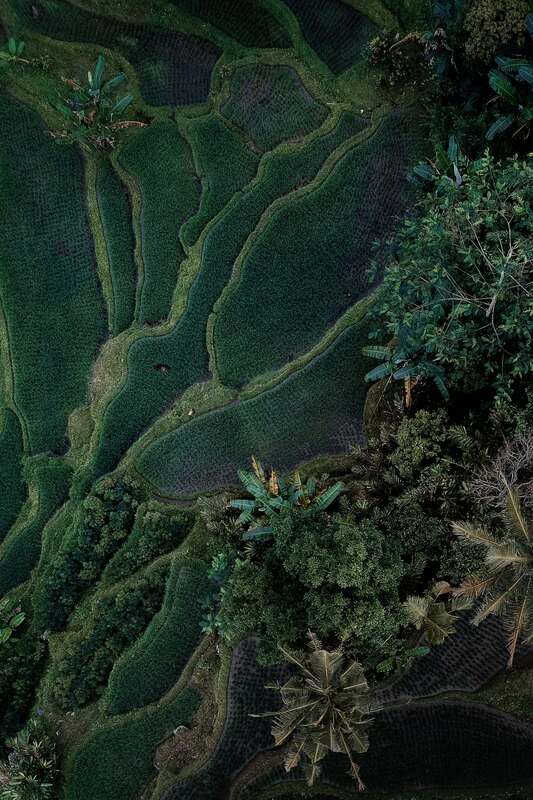 Many visitors to Bali manage to make it as far as Ubud to see the traditional rice fields. But very few get to see them from this angle! Taken with a drone, this view gives you a really unique perspective on the patterns and stunning colours that emerge. There are numerous places to stay in Ubud, so if you have the time, consider making it more than just a day trip. Looking for a Private Villa in Ubud? 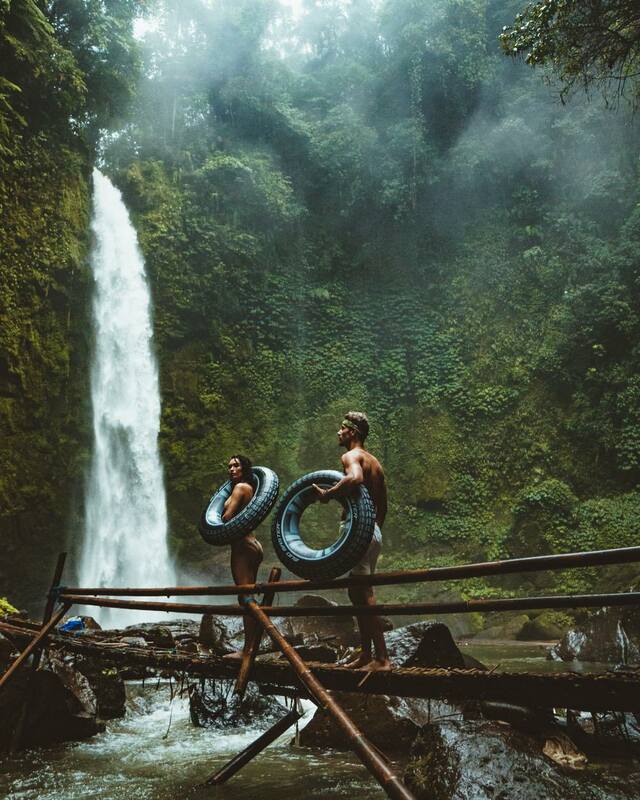 Of all the spectacular waterfalls in Bali, Nungnung Waterfall is one of the most beautiful and impressive, but also virtually unknown to tourists. A real treat to those intrepid enough to seek it out! This waterfall is 70 meters high, and the amount of water thundering down into the plunge pool is truly impressive, especially during the rainy season. 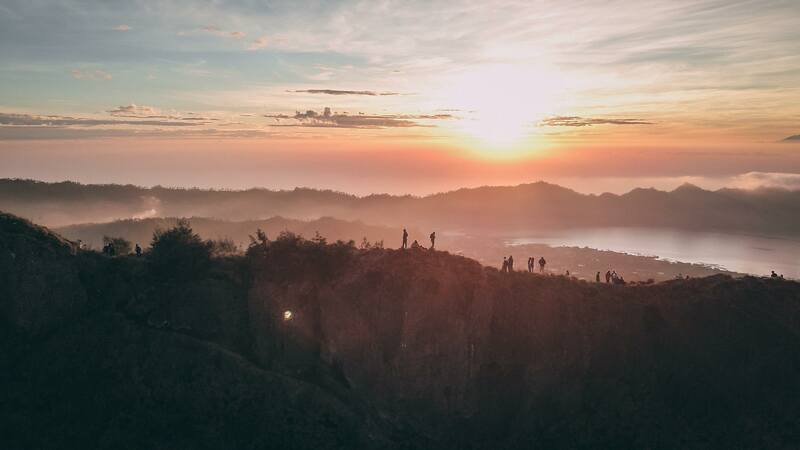 For the adventurous traveller, you can't go past waking up a few hours before dawn and hiking up Mount Batur (which is still an active volcano!). The hike up will take about two hours depending on how physically fit you are. The view from the top is well worth it though. On a clear day, you can see to almost every corner of Bali which is made even more magical as the sun turns the early morning sky a stunning shade of orange, pink and red. 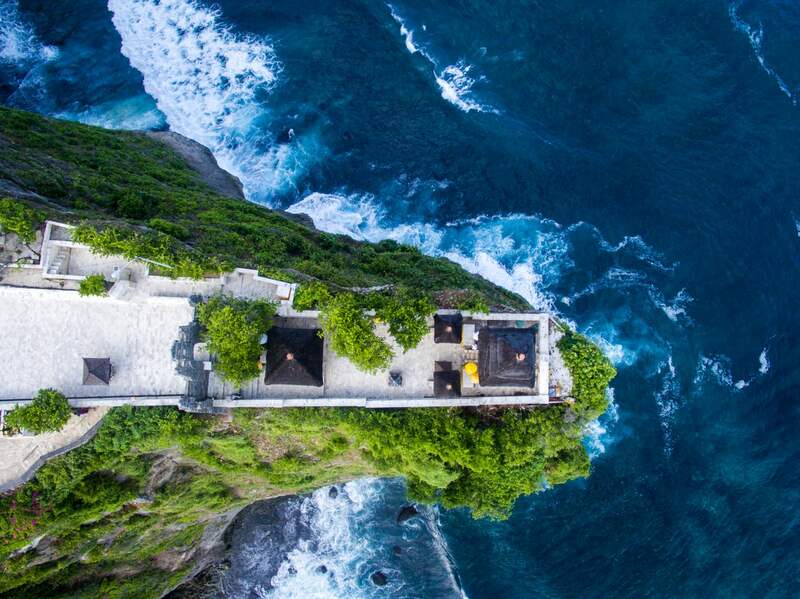 A unique view of the Pura Luhur Uluwatu Temple in Bali. Most tourists who make it to this corner of Bali only ever get to see the cliffside temple from the ground. The temple is perched on a staggeringly steep cliff which is around 70m tall and looms out over the roaring Indian ocean waves. If you plan on doing one of the Volcano climbs, we recommend that you stay in or near Ubud to make it easier to get there and back. We couldn't go past staying in this amazing Bali Hideout which has been handcrafted by a local family entirely out of bamboo.